WASHINGTON, D.C. – The Federal Communications Commission voted Thursday to approve a tax increase that will generate $1.5 billion more each year on technology for the nation’s schools and libraries. School leaders, technology advocates and many businesses urged the government to spend more money to bring schools and libraries up to date. With the increase, a total of about $3.9 billion is now available under E-Rate, a federal program that many rely on to pay for expensive communication services. “We are talking about a moral issue,” Tom Wheeler, the FCC chairman, said during the commission session at which the vote took place. “The greatest responsibility, the greatest moral responsibility that any generation has, is the preparation of the next generation. Nearly 70 percent of schools lack a high-speed Internet connection, and a disproportionate number of them are in poor urban and rural communities, according to estimates from the FCC. Something as simple as watching a YouTube video isn’t easy in schools where systems can’t support the various laptops and tablets proliferating in classrooms. Computers are now frequently used in classroom lessons, rather than limited to shared labs or libraries. The Baltimore County School District Superintendent, S. Dallas Dance, part of a panel of educators who testified before the FCC vote, noted that schools in more affluent communities often have better access to technology. “Such an inequity should not exist across our country,” Dance said. Unreliable connections can limit the use of innovative models of education, such as blended learning programs, that use computers and websites that require increased bandwidth. Some school leaders must reserve their Internet use for computer-based academic achievement tests, to protect fragile systems from collapse. The FCC’s decision to boost spending on Internet infrastructure dovetails with President Barack Obama’s initiative to provide nearly every school with a high-speed Internet connection. Other features of that plan, called ConnectED, include private donations of devices and software, and training for educators so they can make the most of it. “What we don’t want to do is simply put a tablet on top of a textbook and call the job done,” said Phillip Lovell, vice president for policy and advocacy at the Alliance for Excellent Education, an advocacy organization that supported increased funding for E-rate. Students from disadvantaged communities are more likely to attend schools with substandard Internet connections, according to a November report from the Alliance for Excellent Education and the Leading Education by Advancing Digital (LEAD) Commission, nonprofit education policy groups. The report estimated that about 2.75 million low-income students go to schools with slow Internet connections. Many people agreed that school technology systems were out-of-date, but some said wanted improvements paid for by trimming the budget. FCC Commissioner Michael O’Rielly, who opposed the changes to E-rate, said he worried that the order that passed Thursday failed to include safeguards to ensure that the neediest students benefit from the increased spending. “We will cross our fingers that the funding finds its way to the right places,” O’Rielly said. Commissioner Ajit Pai also voted no, and he expressed concern that the new order would not provide the equitable access that supporters hope it will. 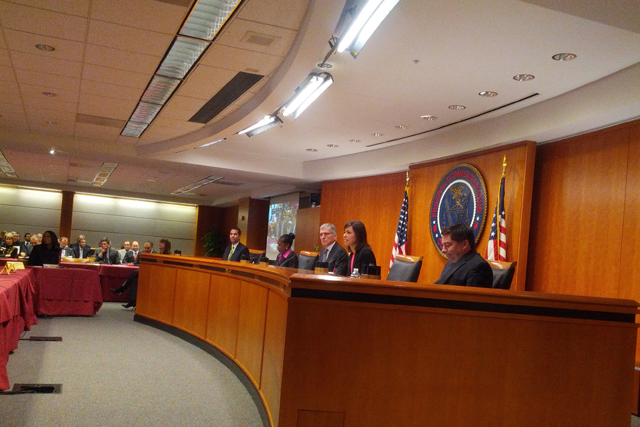 Voting yes on Wheeler’s proposal were FCC commissioners Jessica Rosenworcel and Mignon Clyburn. “It’s time to wind down the era of analog education,” Rosenworcel said. The $1.5 billion increase is the first significant increase in the 18-year-old program’s history. It follows other changes to the program as part of an effort to align spending with modern needs. In July the FCC approved a plan to improve high-speed connections and internal wiring in buildings by making better use of existing money. It phases out services such as telephones, websites, email and pagers. The new priority: infrastructure that supports a high-speed Internet connection and Wi-Fi technology. In a statement, the FCC said that the order passed today also approved other changes besides the cap increase. For instance, the order will help enable schools and libraries to build high-speed broadband facilities themselves, if no cost-effective local alternative exists. After the meeting Thursday, Wheeler said the E-rate order passage was the greatest accomplishment of his career. He was appointed to the FCC by President Obama in November 2013, after a career in private industry. “All of America’s kids, no matter where they live, will have the tools they need,” Wheeler said.